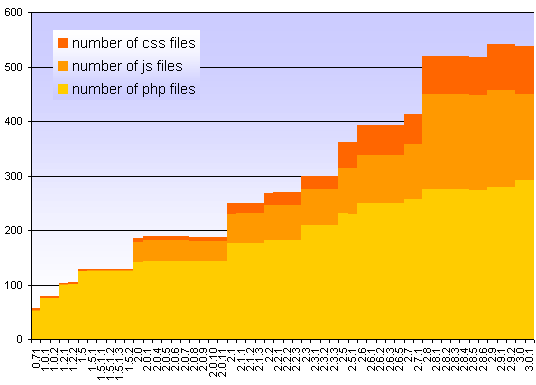 As a sequel to my previous post about the number of functions across WordPress history, let's talk now about files and sizes. In the early days, in was rather cumbersome to download locally a .zip file, uncompress it, then upload the whole stuff to your server. Now that there is a built-in upgrade, the total size of the baby does not really matter, since everything takes just one click. What's noteworthy here is that there seem to be a 3 MB limit for the zip to ensure the core upgrade works on most hosts (see issue raised during the making of WP 3.0). So, unless something changes in the way the WordPress upgrader handles new releases, we are nearing the glass ceiling. 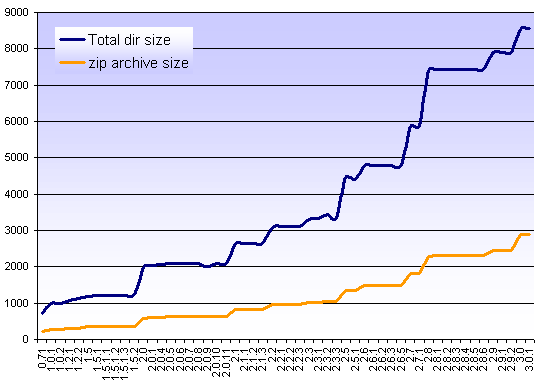 You can obviously correlate the total size with the total number of files, and with the evolution of the number of built-in functions (see previous post). Again here, I would have thought the biggest increase would have been with the WP/WPMU merge in 3.0, but it's not. Anyone remember what was so hefty and new in 2.7 and 2.8? 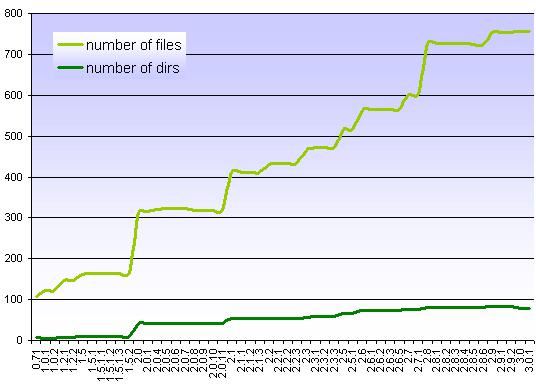 The file system? The inclusion of Simplepie to deprecate Magpie? And, for the curious, the complete data. The glass ceiling is only temporary. We found what we believe are opportunities for optimization/performance improvements in the HTTP API, but it was too late to tackle for 3.0. We'll probably try to visit this in 3.1. This is almost certainly a silly question, but when upgrading why do you have download WordPress in it's entirety and not just the updated files? @Andrew: What are those opportunities? Ozh, I definitely am not in Ukraine, and I believe Rich isn't either. You mean he won't be paying for us to move? @Milan: Based on our tests when researching stopgap solutions for the memory limit issue, we believe there are some performance gains to be had somewhere in the HTTP API as it relates to memory consumption. It's something a few of us hope to thoroughly analyze in 3.1.